The best ab workouts will actually focus less on abdominal exercises, and more on full body, strength building workouts coupled with an optimal diet. To burn belly fat effectively, you must take a comprehensive approach. Please burn this into your brain: There are NO magic ab workouts to give you a cut and defined midsection. If you want to be able to see your abdominal muscles, you must get rid of the layer of fat covering them. * Your most notable and significant results will be directly tied to making good food choices. If you truly want abs that can been seen, you CANNOT eat whatever you please. You must start eating like an athlete if you want to look like one. 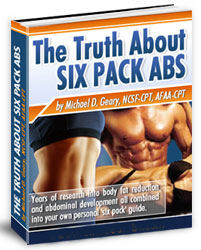 * To see your abs, women will have to get under 16% body fat and men will have to get below 10%. Since the averages are about 23% for women and 16% for men, you can see this effort will definitely require both TIME and focused EFFORT. * Despite what you read on the Internet, you will NOT get defined abs in 3-4 weeks (unless you are gobbling steroids...)Plan on markers at 12 weeks, 24 weeks, and 36 weeks. If you have the self-discipline to eat like an athlete and workout regularly, you will see results. The majority of people are resistant to the reality of this time line. * The best ab workouts will NOT center on escalating the number of crunches or hanging knee-raises you do. They will focus on multi-joint lifts that increase your strength while building lean muscle tissue. * Cardio must be included everyday and it must be focused, not mindless pedaling on a stationary bike while you read a magazine. interval training workouts MUST become part of your fat loss strategy. The best ab workouts will actually be pushing away from the table and integrating brief, intense workouts that combine strength building with focused cardio.